At some point in most photographers’ development there comes the urge to actually do something with the imaging skills we’ve acquired. To sell an idea to people, perhaps, or explain something, to go a little deeper than just being visual arresting. Reportage photography, for example, which is my main interest, is very much about delivering the content to readers or viewers. 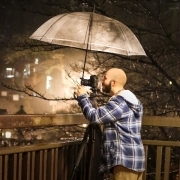 For many photographers, the big next step is using pictures to tell a story. Can you tell, really tell, a story only with images? The word storytelling has crept quietly into the vocabulary of photography, and it’s happened quite recently. Not the actual process of telling stories through photographs, which has a rich and interesting history stretching back almost a century, as we’ll soon see, but the word itself, applied usually to a single picture. It’s common now to see and hear photographs described as having a ‘storytelling’ edge, and it’s always a form of praise—or else a claim by the photographer. 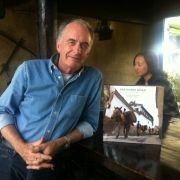 There’s a current fashion to say “I’m a storyteller and each of my pictures tells a story.” It’s a form of boasting. of which we photographers tend to do a lot, but is it possible? 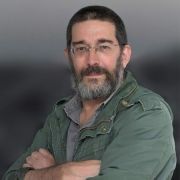 The suggestion is that such an image is superior by having more depth, by having a richness of content that shows the photographer’s ability to uncover the events, interactions, even emotions within the scene. The master of reportage photography, Henri Cartier-Bresson, wrote, “Sometimes there is one unique picture whose composition possesses such vigour and richness, and whose content radiates so outward from it, that this single picture is a whole picture story in itself.” But he was also realistic when he added, “But this rarely happens.” A single image frame has a tough job to enclose any meaningful and absorbing story. What it can do, however, is to suggest the beginnings of a story, and that’s certainly valuable, as in the picture below, where two young girls are about to start an argument. 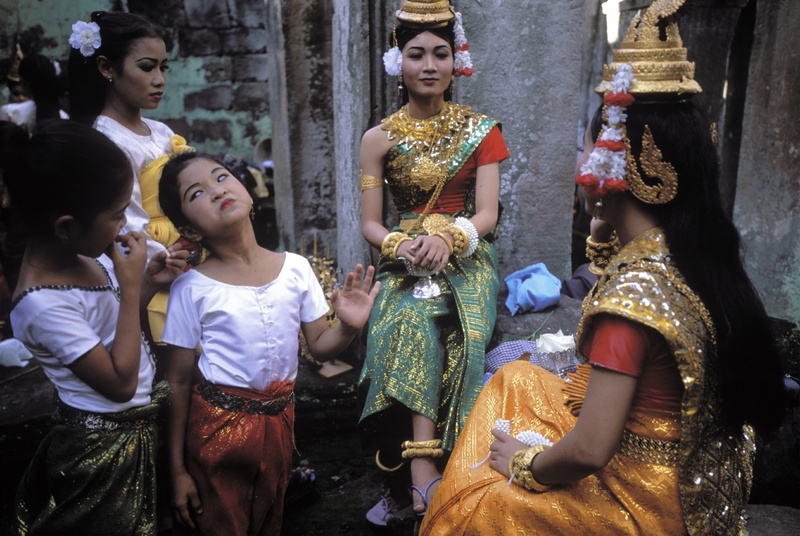 Khmer dancers in traditional dress wait to begin a performance in the Hall of Dancers at Preah Khan, a late-12th century temple at Angkor, Cambodia. But consider what’s involved in a real story, which most of us experience in the form of a novel or a movie. It takes time, because there’s usually a lot to say. There are characters to introduce, a plot to develop, high points and low points, surprises (there should always be surprises). An average novel takes perhaps a couple of days to read if you devoted your time to it. An average movie between an hour and a half and two hours. An average season of a television series about eight hours. Given this, what chance does a single photograph stand? Stories take time to tell and time to absorb. They also work best for the audience when they are rich in things happening, and when they contain surprises. Think of any novel, short story or movie that caught and kept your attention. A single still image is distinctly ill-suited to doing or containing any of this, because everything is presented to the viewer at once. It’s not impossible to show a little story that takes a little time to read from just one image, but it demands two things. First, a scene with some complexity, in which different things are happening. Second, a framing and composition so skilful that the viewer’s eye is actually guided through it, from one part to another. A challenge indeed. 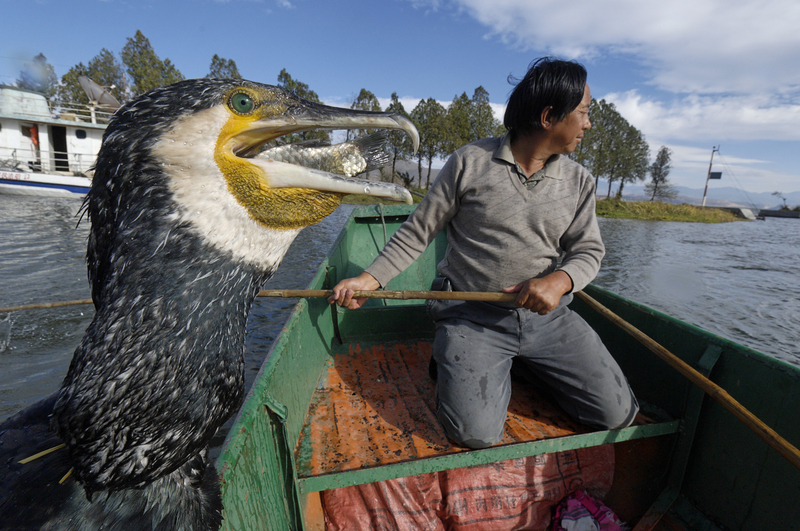 Here’s one image that tries to explain as much as possible about the tradition of fishing with cormorants, still practised in a few places in China and Japan. There’s quite a lot of information here. There’s the cormorant and the fisherman aboard their boat, and the bird has a fish that it has just caught. However, the fish is going no further down its gullet because of the cord tied lower down the cormorant’s neck to prevent it swallowing. 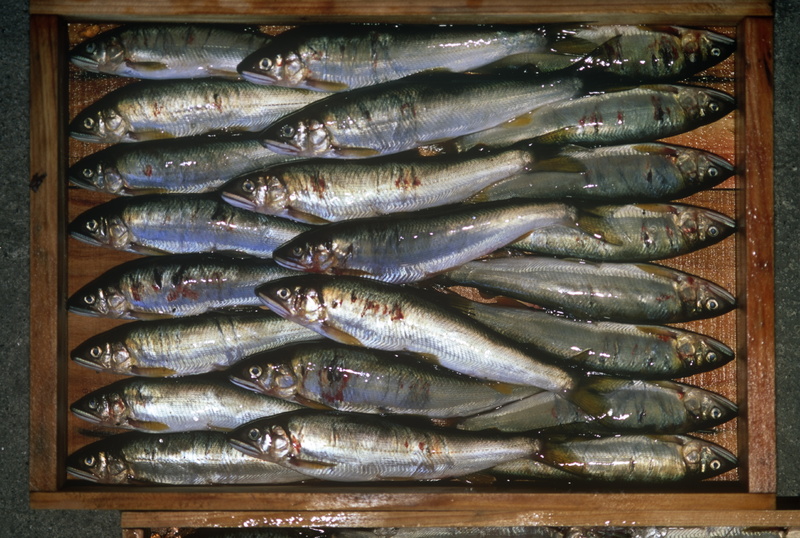 It will be fed when the fishing is complete; any earlier and the bird would lose interest. Could more be crammed in? Perhaps a little, if the situation had allowed it (or if I’d ‘organised’ it). There could have been another fisherman and birds behind in the distance actually diving, but this still doesn’t take us very far. By contrast, what happens if we release the restriction on the single image, and do it in the way that editorial photographers have worked for decades in making a photo story for magazines? This way is to construct the story from a large number of images—many times more are shot than are used—with each photograph contributing a part of the tale. By far the most common kind of storytelling is the narrative, and it’s a universal form that goes back into pre-history. Simply explained, narrative is an account of connected events, presented in a sequence, and it’s the staple form of most novels, documentary books, documentary video and movies. It’s usually ordered by time, simply because that is the clearest way of showing how related events connect with each other—in other words, in a narrative, the storyline and the timeline are usually the same. Embedded in this kind of storytelling is the idea of explaining what is going on, which may sound too obvious to mention, but this is one of the more obvious techniques for success. If the audience looses track of the plot, most will just give up. This seems natural and obvious for a narrator telling a story to a group of listeners, but once we start using other media to do the storytelling—and in this case I mean still photographs—it’s easy to lose sight of this simple, organising principle. Storytelling is universal, and so is narrative, therefore to understand how it works it makes sense to go back to the basics. Structure is the key to almost everything in normal storytelling, for the simple reason that you have an audience that wants to be entertained—and over a period of time. As with everything to do with using photographs to tell stories, this needs a shift of emphasis and even a change of attitude on the part of the photographer. Most of us are simply used to thinking about single images, and cramming as much of our abilities, skills and interest as we’re able into one frame which then has to stand and be judged on its own. Using a number of photographs together means allowing them to work together, so there has to be a plan. In the example shown here, necessarily compressed because we don’t have the luxury of devoting several pages to it, I’m taking cormorant fishing, as in the picture above, but this time doing it as a multi-picture narrative. As I just mentioned, structure is paramount, and so here it means taking a tighter, more specific aspect of cormorant fishing. In this case, I’m following the capture of wild cormorants in Japan through to their fishing. Cormorants cannot be trained from hatchlings to dive and fish, so wild birds must be caught, and that gives a culturally fascinating start to the story. There is only one man in the entire country with the licence to catch, and the shooting begins with him and his special techniques for catching. After that, we move to another part of the country, Gifu, to see these same birds in action, featuring the fisherman for the Imperial Court. Without going into the full explanation here, it should be clear that there’s a wealth of detail and event that can be treated only with several-to-many photographs. 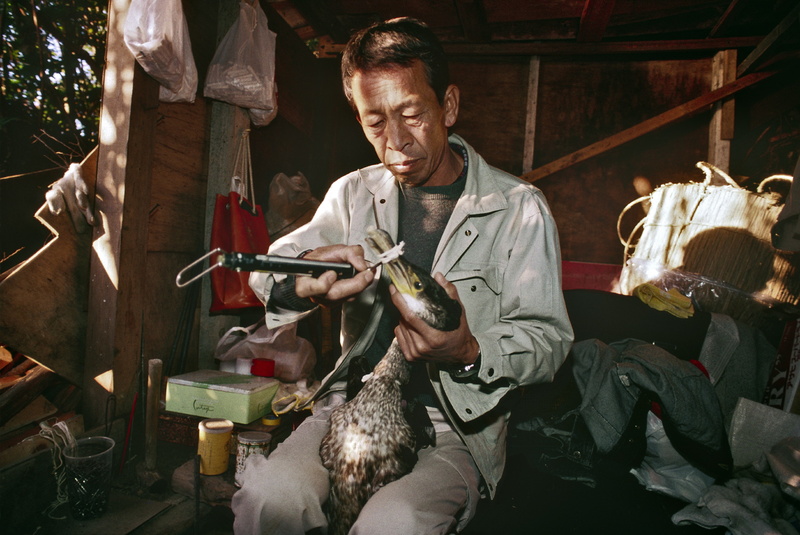 Hiroyuki Numata holds the only license in the whole of Japan to catch wild cormorants, and as such is a Local Living Treasure. 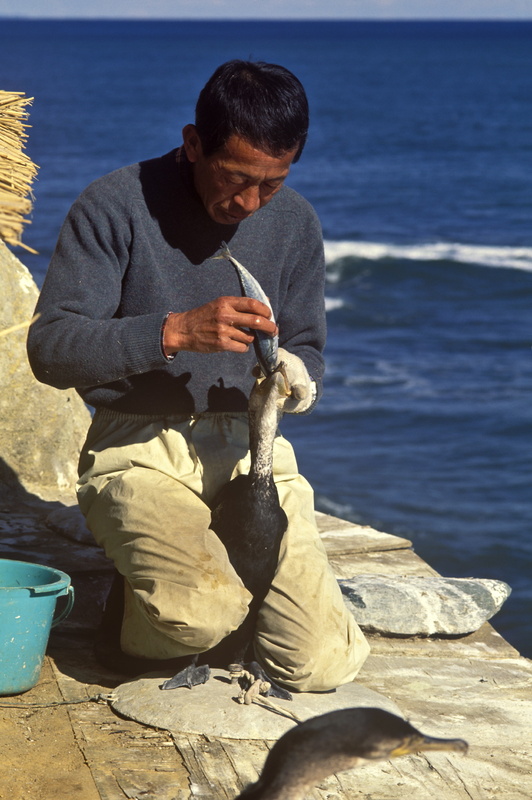 Here on the cliffs of Ishihama, north of Tokyo, he feeds a captured cormorant which will act as a decoy to attract other wild cormorants. Hidden inside a light bamboo structure on the cliff, Numata waits for a wild cormorant to land by the decoy bird, then pulls it in with a small stick coated with sticky lime. As it is impossible to train birds bred in captivity to fish, there needs to be a constant supply of captured eld birds like this one. Numata prepares to weigh the caught bird to make sure it’s old enough to keep. Juvniles are returned to the wild. 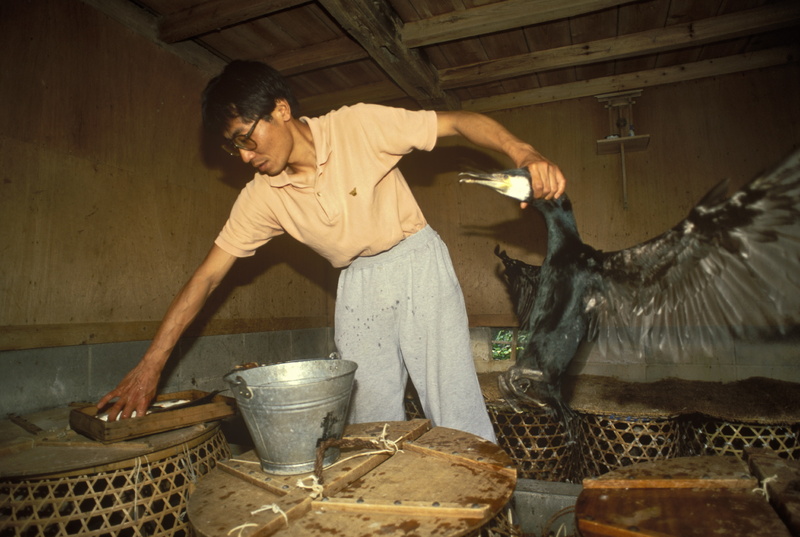 In Gifu city, one of the six Imperial Fishing Masters in the country, prepares some of his cormorants for an evening’s fishing, putting them in individual bamboo baskets to take upriver. 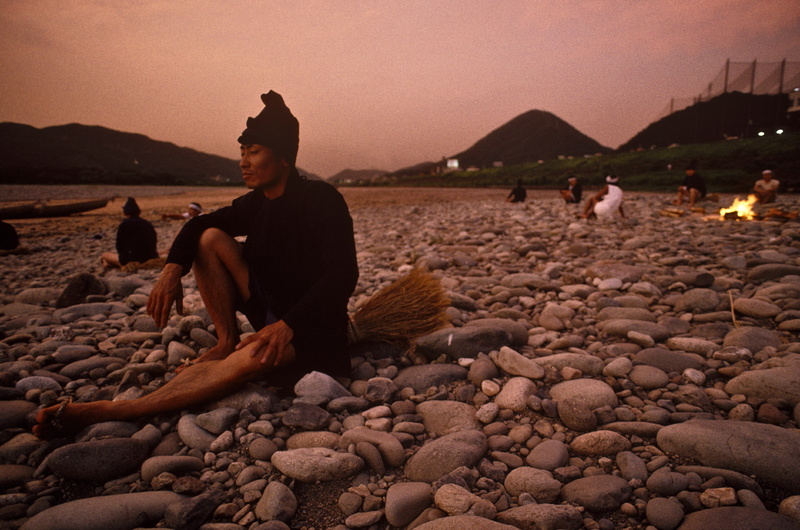 The Fishing Masters, wearing fireproof hats and with their distinctive waterproof straw skirts ready to put on, wait on the upper beach of the Nagara River for darkness. 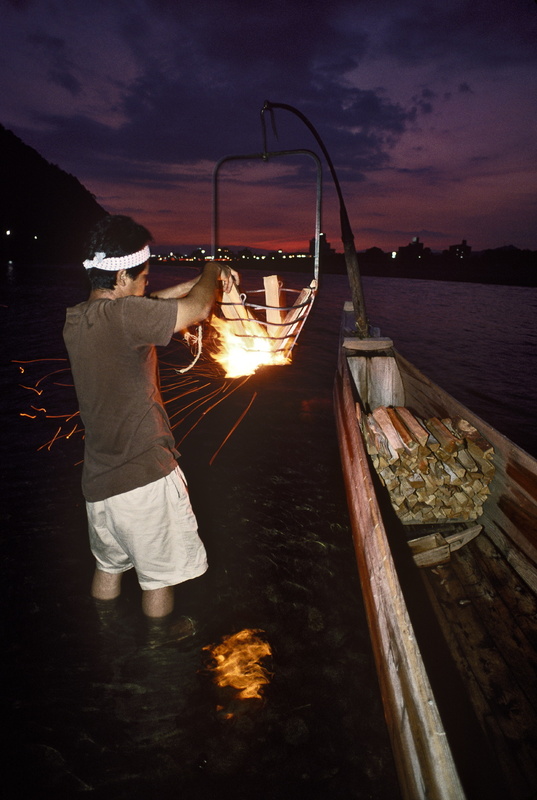 An assistant lights firewood in a brazier that hangs over the front of the boat. 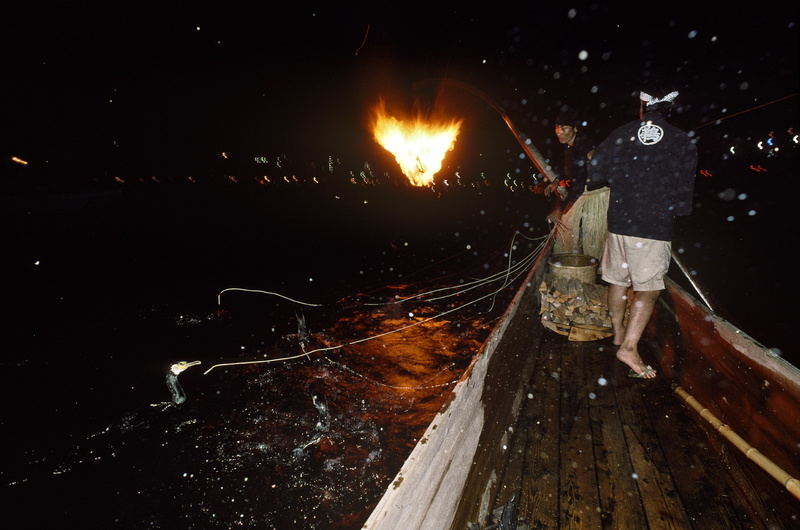 The fire will attract the fish to the surface, making it easier for the cormorants to catch them. After darkness falls, the boats put out onto the river, and float downstream. With the cormorants tethered on lines, the fishing begins. 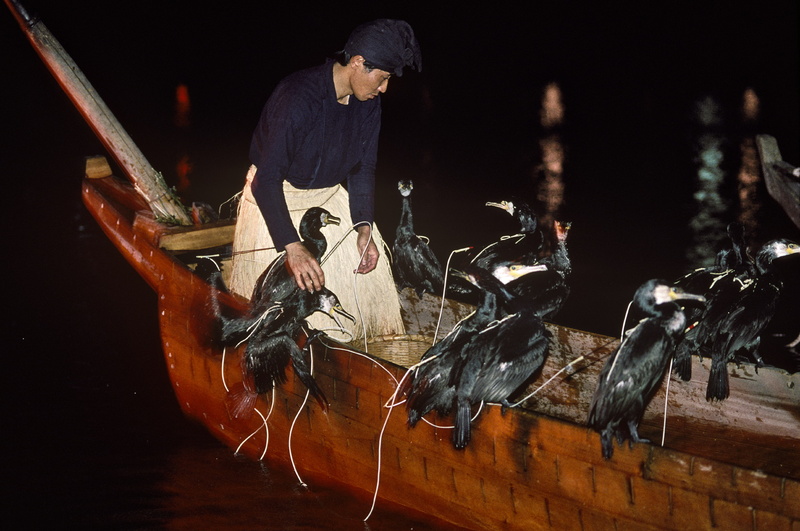 At the end of the half-hour fishing period, the boats dock on the beach at Gifu city, and the cormorants are brought back on board, their final catch disgorged. The cords tied around their necks to prevent them swallowing the fish will now be released, and the birds fed as a reward for their efforts. Sweetfish killed by the cormorants are bloodied from the strikes of the sharp beaks. 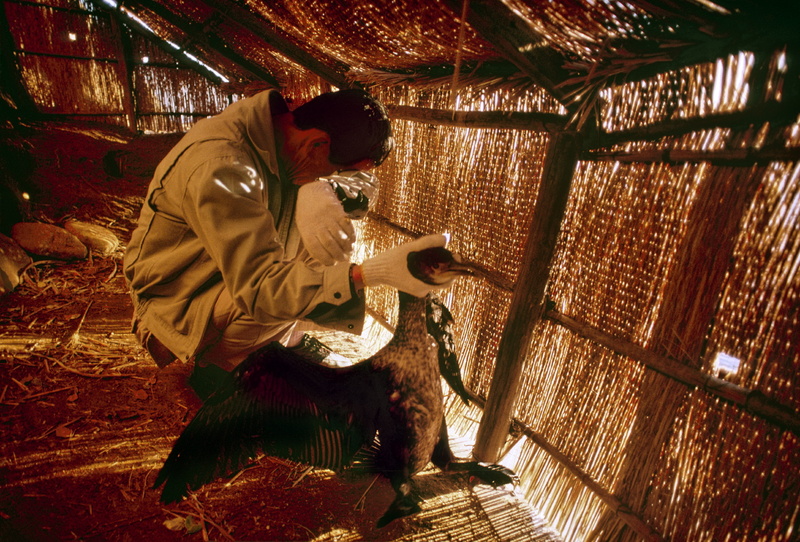 Gourmets believe that the instant death from being struck by a cormorant’s beak preserves their delicate flavour better than any other method of fishing. At the heart of every assignment and every story is the picture script, also known as the shooting script. In a way, this is the secret weapon of feature photojournalists. Everyone has their own way of doing it; mine is written down in a notebook, and I have a basic checklist that I adapt for each story. This is something that you work up from research, and from the briefing that the client gives. If there’s no client, you instruct yourself! But it’s never cast in stone. It evolves and changes as the research progresses, and then as the shooting progresses, because new opportunities often pop up unexpectedly. 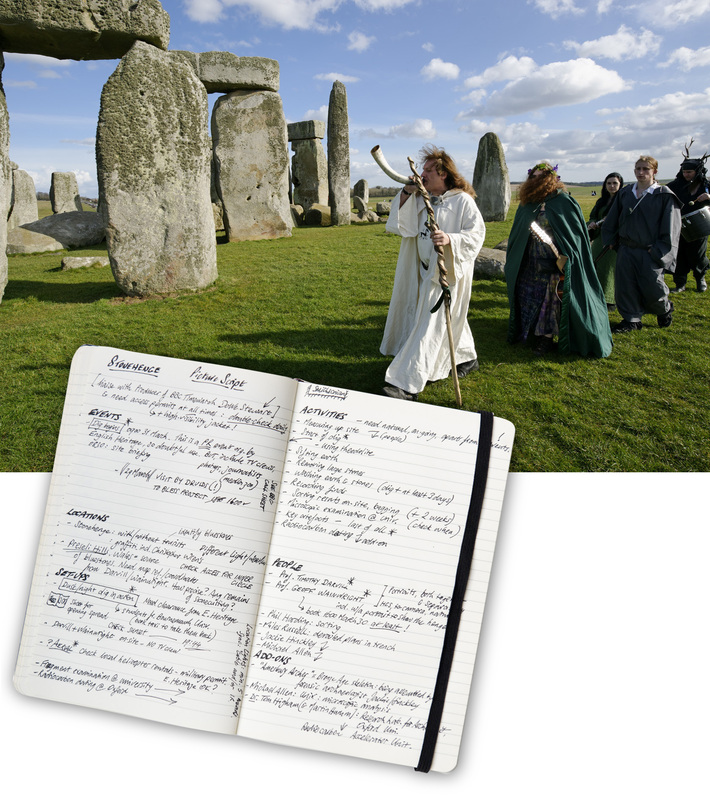 Druids bless Stonehenge before an archaeological dig begins at this famous historical site. This ‘event’ was not expected, but was sufficiently strange to include in the story. We not only can improvise, in the same way as do jazz musicians, but we should. When it comes to planning, it’s worth looking closely at exactly what has to be planned, because it may not be everything. In jazz, the musicians typically improvise the melody, within a beat and chords that have already been set. Reportage photography has quite a bit in common with this. You plan a certain time of day and general location, and perhaps decide in advance on a style and particular lens, then go out hunting, which is a kind of improvisation. This is an example of the value of not planning the detailed shots, while taking them within a planned framework. What I tend to do is to break down the upcoming shoot into basic categories, and then start making lists. There are the physical Locations, then there are possible Events. Less special than specific Events are Activities, and of course People, meaning the particular personalities. Some situations lend themselves to being what I call Set-ups, meaning organised shots. Not everyone agrees with the need to organise elements of a shot, but if you’re in a situation where you need to ask permissions in the first place, it’s usually effective to take some sort of control to give yourself the best angles and moments. Finally, there are what I call Add-ons, meaning shooting situations that may not be directly relevant to the storyline, but might be useful later when it comes to putting the story together. Little diversions, in other words, though not always justifying major effort. Planning a story, with the picture script at the heart of it, means basically doing the research and thinking necessary to cover every important aspect of the them you’ve chosen. 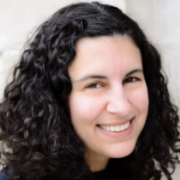 What is the basic story setting? Where is it happening? What’s the context? More than this, it’s important to think ahead about how the images are going to be put together. How you will order them and use them. There’s a traditional set of building blocks for photo stories. They are, simply put, the Opener, the Body of the story, and the Closer, with somewhere among them an important variable, the Key Shot. There may even be two or three such Key Shots, and while they are unpredictable when a story is being planned and photographed, they are the memorable, powerful images that stand out and can even sometimes represent the story by themselves. 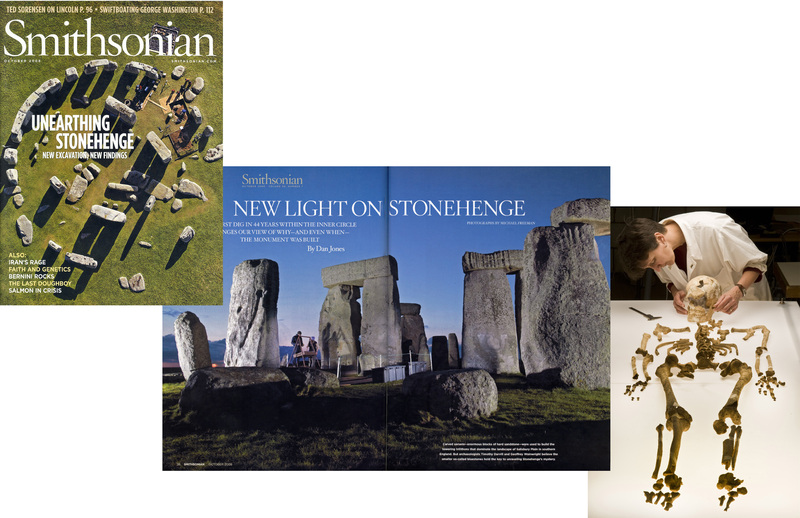 A story for the Smithsonian magazine on a new archaeological dig at Britain’s most visited monument, The opener was set from the beginning—the archaeological work continuing after sunset. The closer was, suitably, a Bronze Age skeleton found ear here, and the Key shot was a graphic helicopter aerial, strong enough to be chosen for the magazine cover. The Opener is important because the storyteller has to grab the attention of the viewer, reader or listener right away. The audience has to be riveted from the start, so that they actually want to continue, whether by turning the page or continuing to watch the screen (and the internet has shortened attention spans). What this means for a photo essay is that, right from the planning, special thought has to go into choosing a strong image for the Opener. It doesn’t have to be in sequence, but it needs to do the job of grabbing attention and being thoroughly relevant. The Body of the story is what it is, and can be of practically any length—although it has to be appropriate to the interest level of the story, and the sequencing of the pictures needs to be both interesting and to develop the story. The Closer brings completeness to the story, rounding it off, and traditionally at least, it should be an image strong enough to look like a proper ending. In the second part of this feature, we’ll look at choosing your theme, how to shoot for visual variety while still staying on theme, and how to select, match, pair and sequence your final set of images.